The new 2nd Edition will be available spring 2018. 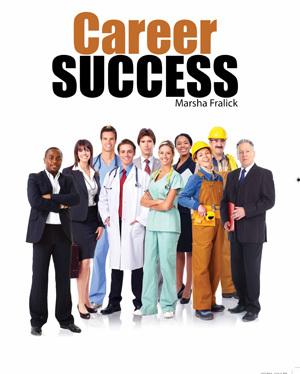 The current price of the printed version of Career Success is $50. career exploration links. Students can continue to use this portfolio as they progress through college and look for employment after graduation. integrated site Indeed.com. Faculty can view and comment on student work online. If you would like a free instructor account for the online version, contact me at marsha@marshafralick.com. · Chapter 1, Create Your Success, helps students take responsibility for career planning and provides them with tools for motivation, positive thinking, adopting successful beliefs and using humor to provide relaxation and perspective. · Concepts from positive psychology are used to help students build on their strengths, think positively about the future and clarify what happiness means to them. · The Do What You Are (DWYA) personality assessment helps students identify their personal strengths and suggests matching careers. Supporting textbook material helps student to understand personality type and how it is connected to career choice and other success skills. · The Interest Profiler integrated into Chapter 3 helps students identify their vocational interests. Career interest areas and matching careers are available on the O*Net database of careers. · Material in Chapter 3 helps students clarify their values and encourages students to act on their values and use them in career decision making. · The MI Advantage helps students identify their multiple intelligences and careers that match their highest intelligences. · An online career portfolio summarizes the results of the DWYA and MI Advantage and provides links to the O*Net database of careers as well as links to current available jobs at Simply Hired. · Material is provided to help students set goals based on personality type, interests, values and multiple intelligences. · Information is provided on current career trends, the career decision making process, educational planning and researching career information and outlook. · Updated job search strategies include the concept of online personal branding and using social media and other online job search tools. · Interactive activities within the text help student to practice the material learned. · Frequent quizzes and answer keys within the chapters help students with reading comprehension and check understanding of key concepts. · Journal entries help students think critically and apply what they have learned to their personal lives. · Individual and group exercises are included at the end of each chapter. · This webswite has resources for faculty and students. Student resources include key ideas, Internet links related to each chapter and Word documents for journal entries. Resources for faculty include the Instructor Manual and Faculty Resources for teaching college success courses including over 500 pages of classroom exercises, handouts, video suggestions, Internet links to related material and much more. An interactive online edition is available. Contact me at marsha@marshafralick.com for an online demo. You can view the reports of sample completed assessments by logging into the e-text demo below. What Are My Lifetime Goals? A Goal or a Fantasy? The Instructor Manual contains over 500 pages of interactive exercises, classroom handouts, and techniques for engaging students in learning. Here is a sample of the Instructor Manual for Chapter 1: Create Your Success. The PowerPoint Library contains a slide for every topic in the textbook. Select the slides that match your student learning outcomes. Here is a sample PowerPoint presentation for Chapter 1: Create Your Success.